The Philippines is frequently subjected to various types of hazards and it has been observed to be increasing throughout the years. Its geographical location and physical environment make it vulnerable to natural hazards such as tropical cyclones, floods, extreme rainfall, thunderstorm (TSTM), storm surges, strong winds, tornado and others. Every year, these hazards bring havoc to life and property, seriously disrupt our agriculture-based economy and disturb the lives of millions of Filipino families. Disasters cannot always be prevented, but its disastrous effects can certainly be mitigated if appropriate measures are adopted. This can be achieved by prper understanding of the hazards and the threat posted by them. For hazard mapping, basic information and observational data on meteorological and hydrological hazards in terms of nature, frequency and magnitude will be gathered, computer processed, validated and analyzed. to locate the hazard, historical records are used to identify critical hazard zone. The result of analysis is usually presented in the form of maps that shows the type and degree of hazard in a given geographical location. Hydrometeorological hazard maps showing the places and frequency of occurrences of hydrometeorological hazards such as tropical cyclones, flooding, TSTM, storm surge, extreme wind, extreme rainfall and other hazards will be prepared and documented. In vulnerability analysis, the availability of more information such as socio-economic profile of the area will be very helpful. Having this information, it is possible to identify geographically, with reasonable accuracy, those elements (i.e. settlements, communities and assets) that are more particularly susceptibe to damage and destruction from a hazard. This can be done by relating the hazard to human settlement and its built environment. The results of vulnerability analysis are also presented in the form of maps. To adequately prepare for a typhoon, you must first understand what typhoon is. A typhoon is a type of tropical cyclone, which is a general term for a circulating weather system over tropical waters. In the Northern Hemisphere they circulate counter-clockwise. Warning Signal No. 1 is raised. •	A tropical cyclone will affect an area. •	Winds of 30-60 kph is expected. •	Intermittent rains may be expected in at least 36 hours. •	Twigs and branches of small trees may be broken. •	Some banana plants may be tilted or uprooted. •	Some houses of very light materials may be partially unroofed. •	Only very light or no damage may be sustained by areas affected. •	Rice crops in flowering stage may suffer significant damage. •	Some coconut trees may tilt. Some of them may break. •	Few big trees may be uprooted. •	Many banana plants may be downed. •	Rice and corn crops may be affected. •	A large number of houses made of light materials may be unroofed. •	Old galvanized iron roofing may be peeled off. •	Many coconut trees may be broken or destroyed. •	Rice and corn crops may suffer heavy losses. •	Majority of light material houses may be unroofed or destroyed. There may be considerable damage to structures of light to medium construction. particularly in the agricultural and industrial sectors. •	A very intense typhoon will affect the area. •	Coconut plantations may suffer extensive damage. •	Many large trees may be uprooted. •	Rice and corn plantation may suffer severe losses. •	Damage to affected communities can be very heavy. Powered by heat from the sea, typhoons are moved by the easterly trade winds, the temperate westerlies and their own energy. From the core the winds have great velocity and as they move ashore they sweep the ocean inward giving birth to torrential rains and flooding. Of the 20 tropical storms that occur each year, on the average, 10 will become typhoons, developing in the Pacific Ocean. Since there is little we can do to prevent typhoons, our best defenses are understanding the storm, early warning and preparation. Warm water, moisture and a wind pattern that spirals inward are the three things that a typhoon needs to grow. When thunderstorms form, moving the warm air higher into the atmosphere and the winds at these levels are light, the structure remains in tact and can strengthen. The eye of the typhoon is the center and is very calm. The most dangerous area is the eye-wall. At 50,000 feet the air is moved outward and that increases the upward motion. When the typhoon makes landfall you get the Storm Surge. This is an area 50-100 miles wide that moves in. A combination of strong storm and shallow water creates a higher, more dangerous surge, which is the greatest threat to man and structure. If the surge happens to come at high tide then the water is even higher. This is called a Storm Tide. 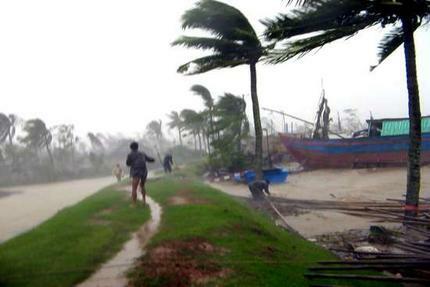 Typhoon force winds can topple poorly constructed buildings and mobile homes. Debris becomes flying missiles and wind gusts can down trees and power lines causing disruption in the basic utilities. Rains moving inland can produce 10 inches or more and cause deadly flooding. This is a great inland danger, also. Typhoons can also spawn tornadoes from the thunderstorms on the outer bands of the typhoon and within the eye-wall. • Know the risk to your area. • Know your evacuation routes. • Know where emergency shelters are. • Follow your Family Disaster Preparedness Plan. • Turn the refrigerator and freezer up to the highest setting. freezer will stay colder longer. • Turn off utilities like water and gas if instructed to do so. for using if water service is disrupted. • Close all internal doors and brace all external doors. away from windows inside as well. even if the windows are closed. Have handy towels, rags and mops. • Listen to the radio or local news. • Avoid bridges and washed out roads. since downed power lines may have it electrically charged. • Check utilities before you use them in case they were damaged. your Family Disaster Plan so you'll be more prepared for the next storm. Earthquakes strike suddenly, without warning. Earthquakes can occur at any time of the year and at any time of the day or night. On a yearly basis, 70 to 75 damaging earthquakes occur throughout the world. Estimates of losses from a future earthquake in the United States approach $200 billion. There are 41 states and territories in the United States at moderate to high risk from earthquakes, and they are located in every region of the country. California experiences the most frequent damaging earthquakes; however, Alaska experiences the greatest number of large earthquakes-most located in uninhabited areas. The largest earthquakes felt in the contiguous United States were along the New Madrid Fault in Missouri, where a three-month long series of quakes from 1811 to 1812 included three quakes larger than a magnitude of 8 on the Richter Scale. These earthquakes were felt over the entire Eastern United States, with Missouri, Tennessee, Kentucky, Indiana, Illinois, Ohio, Alabama, Arkansas, and Mississippi experiencing the strongest ground shaking. What Are Earthquakes, and What Causes Them? An earthquake is a sudden, rapid shaking of the Earth caused by the breaking and shifting of rock beneath the Earth's surface. For hundreds of millions of years, the forces of plate tectonics have shaped the Earth as the huge plates that form the Earth's surface move slowly over, under, and past each other. Sometimes the movement is gradual. At other times, the plates are locked together, unable to release the accumulating energy. When the accumulated energy grows strong enough, the plates break free causing the ground to shake. Most earthquakes occur at the boundaries where the plates meet; however, some earthquakes occur in the middle of plates. Ground shaking from earthquakes can collapse buildings and bridges; disrupt gas, electric, and phone service; and sometimes trigger landslides, avalanches, flash floods, fires, and huge, destructive ocean waves (tsunamis). Buildings with foundations resting on unconsolidated landfill and other unstable soil, and trailers and homes not tied to their foundations are at risk because they can be shaken off their mountings during an earthquake. When an earthquake occurs in a populated area, it may cause deaths and injuries and extensive property damage. The Northridge, California, earthquake of January 17, 1994, struck a modern urban environment generally designed to withstand the forces of earthquakes. Its economic cost, nevertheless, has been estimated at $20 billion. Fortunately, relatively few lives were lost. Exactly one year later, Kobe, Japan, a densely populated community less prepared for earthquakes than Northridge, was devastated by the most costly earthquake ever to occur. Property losses were projected at $96 billion, and at least 5,378 people were killed. These two earthquakes tested building codes and construction practices, as well as emergency preparedness and response procedures. Where earthquakes have occurred in the past, they will happen again. Learn whether earthquakes are a risk in your area by contacting your local emergency management office, American Red Cross chapter, state geological survey, or department of natural resources. Expect aftershocks. Aftershocks are smaller earthquakes that follow the main shock and can cause further damage to weakened buildings. After-shocks can occur in the first hours, days, weeks, or even months after the quake. Be aware that some earthquakes are actually foreshocks, and a larger earthquake might occur. Ground movement during an earthquake is seldom the direct cause of death or injury. Most earthquake-related injuries result from collapsing walls, flying glass, and falling objects as a result of the ground shaking, or people trying to move more than a few feet during the shaking. Much of the damage in earthquakes is predictable and preventable. We must all work together in our communities to apply our knowledge to building codes, retrofitting programs, hazard hunts, and neighborhood and family emergency plans. Develop a Family Disaster Plan. Please see the "Family Disaster Plan" section for general family planning information. Develop earthquake-specific planning. Learn bout earthquake risk in your area. Contact your local emergency management office, American Red Cross chapter, state geological survey, or department of natural resources for historical information and earthquake preparedness for your area. Although there are 41 states or territories at moderate to high risk, many people do not realize the potential for earthquakes in their area. •	Pick "safe places" in each room of your home. more than 10 feet during an earthquake's shaking are most likely to experience injury. •	Practice drop, cover, and hold-on in each safe place. Drop under a sturdy desk or table, hold on, and protect your eyes by pressing your face against your arm. Practicing will make these actions an automatic response. When an earthquake or other disaster occurs, many people hesitate, trying to remember what they are supposed to do. Responding quickly and automatically may help protect you from injury. •	Practice drop, cover, and hold-on at least twice a year. Frequent practice will help reinforce safe behavior. have different requirements for earthquake protection. Study locations of active faults, and if you are at risk, consider purchasing earthquake insurance. your plan. Everyone in your home should know what to do if an earthquake occurs. Assure yourself that others will respond properly even if you are not at home during the earthquake. •	Get training. Take a first aid class from your local Red Cross chapter. Get training on how to use a fire extinguisher from your local fire department. Keep your training current. Training will help you to keep calm and know what to do when an earthquake occurs. •	Discuss earthquakes with your family. Everyone should know what to do in case all family members are not together. Discussing earthquakes ahead of time helps reduce fear and anxiety and lets everyone know how to respond. •	Find safe places in every room of your home and your classroom. Look for safe places inside and outside of other buildings where you spend time. The shorter the distance you have to travel when the ground shakes, the safer you will be. Earthquakes can happen anytime and anywhere, so be prepared wherever you go. •	If you're indoors during an earthquake, drop, cover, and hold on. Get under a desk, table or bench. Hold on to one of the legs and cover your eyes. If there's no table or desk nearby, sit down against an interior wall. An interior wall is less likely to collapse than a wall on the outside shell of the building. Pick a safe place where things will not fall on you, away from windows, bookcases, or tall, heavy furniture. It is dangerous to run outside when an earthquake happens because bricks, roofing, and other materials may fall from buildings during and immediately following earthquakes, injuring persons near the buildings. •	Wait in your safe place until the shaking stops, then check to see if you are hurt. You will be better able to help others if you take care of yourself first, then check the people around you. Move carefully and watch out for things that have fallen or broken, creating hazards. Be ready for additional earthquakes called "aftershocks." •	Be on the lookout for fires. Fire is the most common earthquake-related hazard, due to broken gas lines, damaged electrical lines or appliances, and previously contained fires or sparks being released. •	If you must leave a building after the shaking stops, use the stairs, not the elevator. Earthquakes can cause fire alarms and fire sprinklers to go off. You will not be certain whether there is a real threat of fire. As a precaution, use the stairs. •	If you're outside in an earthquake, stay outside. Move away from buildings, trees, streetlights, and power lines. Crouch down and cover your head. Many injuries occur within 10 feet of the entrance to buildings. Bricks, roofing, and other materials can fall from buildings, injuring persons nearby. Trees, streetlights, and power lines may also fall, causing damage or injury. •	A flashlight and sturdy shoes by each person's bedside. •	Bolt bookcases, china cabinets, and other tall furniture to wall studs. Brace or anchor high or top-heavy objects. During an earthquake, these items can fall over, causing damage or injury. •	Secure items that might fall (televisions, books, computers, etc.). Falling items can cause damage or injury. •	Install strong latches or bolts on cabinets. The contents of cabinets can shift during the shaking of an earthquake. Latches will prevent cabinets from flying open and contents from falling out. •	Move large or heavy objects and fragile items (glass or china) to lower shelves. There will be less damage and less chance of injury if these items are on lower shelves. •	Store breakable items such as bottled foods, glass, and china in low, closed cabinets with latches. Latches will help keep contents of cabinets inside. •	Store weed killers, pesticides, and flammable products securely in closed cabinets with latches, on bottom shelves. Chemical products will be less likely to create hazardous situations from lower, confined locations. •	Hang heavy items, such as pictures and mirrors, away from beds, couches, and anywhere people sit. Earthquakes can knock things off walls, causing damage or injury. •	Brace overhead light fixtures. During earthquakes, overhead light fixtures are the most common items to fall, causing damage or injury. •	Strap the water heater to wall studs. The water heater may be your best source of drinkable water following an earthquake. Protect it from damage and leaks. •	Bolt down any gas appliances. After an earthquake, broken gas lines frequently create fire hazards. •	Install flexible pipe fittings to avoid gas or water leaks. Flexible fittings will be less likely to break. •	Repair any deep cracks in ceilings or foundations. Get expert advice if there are signs of structural defects. 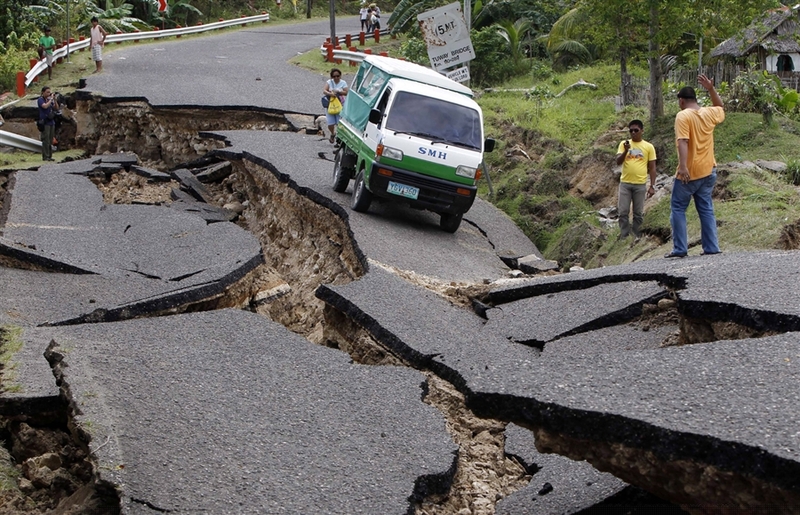 Earthquakes can turn cracks into ruptures and make smaller problems bigger. •	Check to see if your house is bolted to its foundation. Homes bolted to their foundations are less likely to be severely damaged during earthquakes. Homes that are not bolted have been known to slide off their foundations, and many have been destroyed because they are uninhabitable. •	Consider having your building evaluated by a professional structural design engineer. Ask about home repair and strengthening tips for exterior features, such as porches, front and back decks, sliding glass doors, canopies, carports, and garage doors. Learn about additional ways you can protect your home. A professional can give you advice on how to reduce potential damage. Follow local seismic building standards and safe land use codes that regulate land use along fault lines. Some municipalities, counties, and states have enacted codes and standards to protect property and occupants. Learn about your area's codes before construction. •	Ask your community to develop stronger building codes. Building codes are the public's first line of defense against earthquakes. The codes specify the levels of earthquake forces that structures must be designed to withstand. As ground motions of greater intensity have been recorded, the minimum earthquake requirements specified in building codes have been raised. •	Publish a special section in your local newspaper with emergency information on earthquakes. Localize the information by printing the phone numbers of local emergency services offices, the American Red Cross, and hospitals. •	Conduct a week-long newspaper series on locating hazards in the home. •	Work with local emergency services and American Red Cross officials to prepare special reports for people with mobility impairments about what to do during an earthquake. •	Provide tips on conducting earthquake drills in the home. •	Interview representatives of the gas, electric, and water companies about shutting off utilities. •	Drop, cover, and hold on! Move only a few steps to a nearby safe place. Most injured persons in earthquakes move more than five feet during the shaking. It is very dangerous to try to leave a building during an earthquake because objects can fall on you. Many fatalities occur when people run outside of buildings, only to be killed by falling debris from collapsing walls. In U.S. buildings, you are safer to stay where you are. •	If you are in bed, hold on and stay there, protecting your head with a pillow. You are less likely to be injured staying where you are. Broken glass on the floor has caused injury to those who have rolled to the floor or tried to get to doorways. •	If you are outdoors, find a clear spot away from buildings, trees, streetlights, and power lines. Drop to the ground and stay there until the shaking stops. Injuries can occur from falling trees, street-lights and power lines, or building debris. •	If you are in a vehicle, pull over to a clear location, stop and stay there with your seatbelt fastened until the shaking has stopped. Trees, power lines, poles, street signs, and other overhead items may fall during earthquakes. Stopping will help reduce your risk, and a hard-topped vehicle will help protect you from flying or falling objects. Once the shaking has stopped, proceed with caution. Avoid bridges or ramps that might have been damaged by the quake. •	Stay indoors until the shaking stops and you're sure it's safe to exit. More injuries happen when people move during the shaking of an earthquake. After the shaking has stopped, if you go outside, move quickly away from the building to prevent injury from falling debris. •	Stay away from windows. Windows can shatter with such force that you can be injured several feet away. •	In a high-rise building, expect the fire alarms and sprinklers to go off during a quake. Earthquakes frequently cause fire alarm and fire sprinkler systems to go off even if there is no fire. Check for and extinguish small fires, and, if exiting, use the stairs. •	If you are in a coastal area, move to higher ground. Tsunamis are often created by earthquakes. (See the "Tsunami"section for more information). •	If you are in a mountainous area or near unstable slopes or cliffs, be alert for falling rocks and other debris that could be loosened by the earthquake. Landslides commonly happen after earthquakes. (See the "Landslide" section for more information. •	Check yourself for injuries. Often people tend to others without checking their own injuries. You will be better able to care for others if you are not injured or if you have received first aid for your injuries. •	Protect yourself from further danger by putting on long pants, a long-sleeved shirt, sturdy shoes, and work gloves. This will protect your from further injury by broken objects. •	After you have taken care of yourself, help injured or trapped persons. If you have it in your area, call 9-1-1, then give first aid when appropriate. Don't try to move seriously injured people unless they are in immediate danger of further injury. •	Look for and extinguish small fires. Eliminate fire hazards. Putting out small fires quickly, using available resources, will prevent them from spreading. Fire is the most common hazard following earthquakes. Fires followed the San Francisco earthquake of 1906 for three days, creating more damage than the earthquake. •	Leave the gas on at the main valve, unless you smell gas or think it's leaking. It may be weeks or months before professionals can turn gas back on using the correct procedures. Explosions have caused injury and death when homeowners have improperly turned their gas back on by themselves. •	Clean up spilled medicines, bleaches, gasoline, or other flammable liquids immediately. Avoid the hazard of a chemical emergency. •	Open closet and cabinet doors cautiously. Contents may have shifted during the shaking of an earthquake and could fall, creating further damage or injury. •	Inspect your home for damage. Get everyone out if your home is unsafe. Aftershocks following earthquakes can cause further damage to unstable buildings. If your home has experienced damage, get out before aftershocks happen. •	Help neighbors who may require special assistance. Elderly people and people with disabilities may require additional assistance. People who care for them or who have large families may need additional assistance in emergency situations. •	Listen to a portable, battery-operated radio (or television) for updated emergency information and instructions. If the electricity is out, this may be your main source of information. Local radio and local officials provide the most appropriate advice for your particular situation. •	Expect aftershocks. Each time you feel one, drop, cover, and hold on! Aftershocks frequently occur minutes, days, weeks, and even months following an earthquake. •	Watch out for fallen power lines or broken gas lines, and stay out of damaged areas. Hazards caused by earthquakes are often difficult to see, and you could be easily injured. •	Stay out of damaged buildings. If you are away from home, return only when authorities say it is safe. Damaged buildings may be destroyed by aftershocks following the main quake. •	Use battery-powered lanterns or flashlights to inspect your home. Kerosene lanterns, torches, candles, and matches may tip over or ignite flammables inside. •	Inspect the entire length of chimneys carefully for damage. Unnoticed damage could lead to fire or injury from falling debris during an aftershock. Cracks in chimneys can be the cause of a fire years later. •	Take pictures of the damage, both to the house and its contents, for insurance claims. •	Avoid smoking inside buildings. Smoking in confined areas can cause fires. When entering buildings, use extreme caution. Building damage may have occurred where you least expect it. Carefully watch every step you take. •	Examine walls, floor, doors, staircases, and windows to make sure that the building is not in danger of collapsing. •	Check for gas leaks. If you smell gas or hear a blowing or hissing noise, open a window and quickly leave the building. Turn off the gas, using the outside main valve if you can, and call the gas company from a neighbor's home. If you turn off the gas for any reason, it must be turned back on by a professional. •	Look for electrical system damage. If you see sparks or broken or frayed wires, or if you smell burning insulation, turn off the electricity at the main fuse box or circuit breaker. If you have to step in water to get to the fuse box or circuit breaker, call an electrician first for advice. •	Check for sewage and water line damage. If you suspect sewage lines are damaged, avoid using the toilets and call a plumber. If water pipes are damaged, contact the water company and avoid using water from the tap. You can obtain safe water from undamaged water heaters or by melting ice cubes. •	Watch for loose plaster, drywall, and ceilings that could fall. •	Use the telephone only to report life-threatening emergencies. Telephone lines are frequently overwhelmed in disaster situations. They need to be clear for emergency calls to get through. •	Watch animals closely. Leash dogs and place them in a fenced yard. The behavior of pets may change dramatically after an earthquake. Normally quiet and friendly cats and dogs may become aggressive or defensive. Home fire is the disaster that children are most likely to experience. It is the fifth leading unintentional cause of injury and death in the United States, behind motor vehicle crashes, falls, poisoning by solids or liquids, and drowning. It also ranks as the first cause of death for children under the age of 15 at home. Roughly 80 percent of all fire deaths occur where people sleep, such as in homes, dormitories, barracks, or hotels. The majority of fatal fires occur when people are likely to be less alert, such as nighttime sleeping hours. Nearly all home and other building fires are preventable, even arson fires. The majority of arson fires are caused by juveniles, who often respond to counseling, and the rest can be deterred in a number of ways. No fire is inevitable. In 1995, 3,640 people died in reported home fires in the United States - roughly 10 people per day. In addition, thousands of people were injured in home fires, many hospitalized for severe burns; some disfigured for life. Victims are disproportionately children or elderly. Two of every five fires that kill young children are started by children playing with fire. Approximately 900 older adults die in fires annually. Learn more about fire safety by contacting your local fire department, emergency management office. •	The leading cause of death in a fire is asphyxiation, by a three-to- one ratio over burns. Fire consumes the oxygen in the air, while increasing the concentration of deadly carbon monoxide and other toxic gases in the atmosphere. Inhaling carbon monoxide can cause loss of consciousness or death within minutes. •	The heat from a hostile fire exceeds anything to which a person is normally exposed. A fully developed room fire has temperatures over 1,100 degrees Fahrenheit. •	Fire generates a black, impenetrable smoke that blocks vision and stings the eyes. It is impossible to navigate through such smoke, so fire drill participants should practice evacuating buildings by at least two routes. •	If smoke alarms are not already in place, install them outside each sleeping area and on each additional level of your home in accordance with local codes. Smoke alarms cut your chances of dying in a home fire nearly in half. Smoke alarms sense abnormal amounts of smoke or invisible combustion gases in the air. They can detect both smoldering and flaming fires. The National Fire Alarm Code(r)(NFPA 72) now requires hard-wired smoke alarms in new homes. •	Draw a floor plan of your home; mark two fire escape routes for each room. In thick, heavy, dark smoke it is easy to become disoriented. Creating a floor plan with two routes greatly helps everyone understand the safest routes during a frightening emergency. •	Consider escape ladders for sleeping areas on the second or third floor. Learn how to use them, and store them near the window. If main escape routes via stairs are blocked by smoke or fire, the windows may be your only alternative. Escape ladders permit quick exits, reducing time spent in smoke-filled, toxic environments while waiting for firefighters. •	Burglar bars and locks that block outside window entry must be easy to open from the inside. If a key is required to open bars or locks, keep a key near each window to use for fire escape. Quick-release devices are available for security bars. If smoke or fire is blocking the main exit, you must be able to use your alternate routes quickly. Fire deaths have occurred when people were trapped by security bars and were unable to get out and firefighters were unable to get in. •	Select a safe outside meeting place for everyone to meet after escaping from a fire. Make sure it will be a safe distance from heat, smoke, and flames. Family members may use different escape routes, exiting on different sides of the home. Gathering in a specific meeting place in front of the home will quickly let you know who is out, and allow you to advise firefighters of who may need help and their probable location inside. •	Conduct a home fire drill at least twice a year with all members of your household. Fires produce thick, dark smoke that irritates the eyes and breathing passages and can cause confusion. People who have become disoriented in fires have been found in closets, stairwells, and laundry rooms, thinking they were exits. Practicing your plan makes the actual response more of an appropriate reaction, requiring less thinking during an emergency situation. •	Practice alerting other household members. Yell "Fire!" several times during your escape. In a real fire this will alert family members to get out. •	Practice a crawl-low escape from your bedroom, as if you were crawling under a layer of smoke. Fires produce many toxic gases. Some are heavy and will sink low to the floor; others will rise, carrying soot towards the ceiling. Crawling with your head at a level of one to two feet above the ground above the ground will temporarily provide the best air. Close doors behind you. •	Practice evacuating the building blindfolded. In a real fire situation, the amount of smoke generated by a fire will most likely make it impossible to see. •	Learn the emergency number for your local fire department. After leaving your home, you will need to call this number from an outside phone or from a neighbor's house. •	Teach family members to get out first, then call for help from a neighbor's house or outside phone. Get out of the house, away from toxic smoke and gases. If a portable phone is handy during your escape, you may take it with you, but do not waste precious time looking for one. Use your neighbor's phone, a car phone, or nearby pay phone to call for help. Discuss fires with your family. Everyone should know what to do in case all family members are not together. Discussing disaster ahead of time helps reduce fear and lets everyone know how to respond during a fire. Practice stop, drop, and roll. Know how to stop, drop, and roll in case your clothes catch on fire. Stop what you are doing, drop to the ground, cover your face, and roll back and forth until the flames go out. Running will only make the fire burn faster. Practicing makes the actual response more of an appropriate reaction, requiring less thinking time during an actual emergency situation. Children have a tendency to confuse this message with messages about escaping from a fire, so make sure that they understand that "stop, drop, and roll" is to be used only when clothing catches on fire. Once the flames are out, cool the burned skin with water for 10 to 15 minutes and get medical attention. Matches and lighters are tools for "grown-ups." These tools help adults use fire properly. Instruct children to tell an adult right away if they find them or see someone playing with fire, matches, or lighters. National Fire Protection Association (NFPA) research has shown that children associate tools with grown-ups, and "grown-up" is a term children use for someone in authority. •	If a fire starts in your home or you hear the smoke alarm, yell "Fire!" several times and go outside right away. Smoke alarms go off because there is enough smoke and toxic gas to cause harm. Yell to let people know the emergency is real, and they should get out. If you live in a building with elevators, use the stairs. Never try to hide from fire. Leave all your things where they are and save yourself. •	If your escape route is filled with smoke, use your second way out. It is very hard to find your way through thick, heavy smoke. Using your second way out will provide a safer alternative. •	Practice crawling low. If you must escape through smoke, crawl low, under the smoke, to escape. Fires produce many poisonous gases. Some are heavy and will sink low to the floor; others will rise, carrying soot towards the ceiling. Crawling with your head at a level of one to two feet above the ground will temporarily provide the best air. Close doors behind you. •	If you are escaping through a closed door, feel the door, cracks, and doorknob with the back of your hand before opening the door. If it is cool and there is no smoke at the bottom or top, open the door slowly. If you see smoke or fire beyond the door, close it and use your second way out. If the door is at all warm, use your second way out. It is a natural tendency to automatically use the door, but fire may be right outside. Feeling the door will warn you of possible danger. The back of your hand is more sensitive to heat than the palm or fingers. •	If smoke, heat, or flames block your exit routes and you cannot get outside safely, stay in the room with the door closed. Open the window for ventilation, and hang a sheet outside the window so firefighters can find you. If there is a phone in the room, call the fire department and tell them where you are. Seal around doors and vents with duct tape, towels, or sheets to help slow deadly smoke from entering the room. Wait by the window for help. The first thing firefighters will do when they arrive at a fire is check for trapped persons. Hanging a sheet out lets them know where to find you. •	Get out as safely and quickly as you can. The less time you are exposed to poisonous gases, heat, or flames, the safer you will be. •	Once you are outside, go to your meeting place and then send one person to call the fire department. Ask children if they know where their outside meeting place is. Tell them to go directly to this meeting place in case of a fire and stay there. Gathering in a specific outside location in front will quickly let you know who is outside, and allow you to advise firefighters of who may need help and their probable location inside. •	Once you are out, stay out. Children are often concerned about the safety of their pets, so discuss this issue before a fire starts. In many cases, pets are able to get out on their own. Many people are overcome by smoke and poisonous gases while trying to rescue others, pets, or possessions. No one should go into a burning or smoking building except a trained firefighter who has proper breathing apparatus and protective clothing. Firefighters are our friends, and they will help in case of a fire. Visit a fire station to help ease children's fears. A fire suit and mask are often frightening and children may try to hide from a firefighter in full protective gear. •	If smoke alarms are not already in place, install them outside each sleeping area and on each additional level of your home in accordance with local codes. Smoke alarms cut your chances of dying in a home fire nearly in half. Smoke alarms sense abnormal amounts of smoke or invisible combustion gases in the air. They can detect both smoldering and flaming fires. The National Fire Alarm Code(r) (NFPA 72) now requires hard- wired smoke alarms in new homes. •	If people sleep with doors closed, install smoke alarms inside sleeping areas too. If a fire occurs inside the room, dangerous gases can cause heavier sleep. Smoke alarms inside bedrooms will be more likely to wake you. •	Vacuum cobwebs and dust from your smoke alarms monthly. Smoke alarms are less sensitive when they are dirty. Keep them operating most efficiently. •	Use the test button to test your smoke alarms once a month. The test feature tests all electronic functions and is safer than testing with a controlled fire (matches, lighters, cigarettes). If necessary, replace batteries immediately. Make sure children know what your smoke alarm sounds like. •	If you have battery-powered smoke alarms, replace batteries at least once a year. Some agencies recommend you replace batteries when the time changes from standard daylight savings each spring and again in the fall. "Change your clock, change your batteries," is a positive theme and has become a common phrase. While replacing batteries this often certainly will not hurt, available data show that batteries will last at least a year, so more frequent replacement is not necessary. Also, time does not change in Arizona, Hawaii, the eastern portion of Indiana, Puerto Rico, American Samoa, and Guam. •	Replace your smoke alarms every 10 years. Smoke alarms become less sensitive over time. This is a joint recommendation by the National Fire Protection Association and the U.S. Consumer Products Safety Commission. •	Consider having one or more working fire extinguishers in your home. There are three home fire extinguisher ratings: "A" rated extinguishers are for wood or paper fires only; "B" rated extinguishers are for flammable liquid and grease fires; and "C" rated extinguishers are for electrical fires. You can get fire extinguishers that have multiple ratings. An extinguisher rated A-B-C is recommended for home use. Smaller fire extinguishers are designed for one-time use and cannot be recharged. •	Get training from the fire department or a fire extinguisher manufacturer on how to use your fire extinguisher. Fire extinguishers from various manufacturers operate in different ways. Unless you know how to use your extinguisher, you may not be able to use it effectively. There is no time to read directions during an emergency. Only adults should handle and use extinguishers. •	Install extinguishers high on the wall, near an exit and away from heat sources. Extinguishers should be easily accessible to adults trained to use them, and kept away from children's curious hands. Heat may make the contents less effective or cause the extinguisher to lose its charge more quickly. •	If you try to use a fire extinguisher on a fire and the fire does not immediately die down, drop the extinguisher and get out. Most portable extinguishers empty in 8 to 10 seconds. After some residential fires, people have been found dead with fire extinguishers near them or in their arms. •	Look at your fire extinguisher to ensure it is properly charged. Fire extinguishers will not work properly if they are not properly charged. Use the gauge or test button to check proper pressure. Follow manufacturer's instructions for replacement or recharging fire extinguishers. If the unit is low on pressure, damaged, or corroded, replace it or have it professionally serviced. •	When building a home, for about the same expenditure of installing carpet, upgrading cabinets, or adding a spa, you can install a home fire sprinkler system to safeguard your family. A good rule of thumb estimate is to add one to one-and-a-half percent to the cost of new housing. Fire sprinklers can also be installed in existing homes. When you consider the degree of built-in reliability and responsiveness that home fire sprinklers offer, the investment is a wise one. •	Modern residential sprinklers are inconspicuous and can be mounted flush with walls or ceilings. Some sprinklers can even be concealed. Just like regular plumbing, pipes can be hidden behind ceilings or walls. •	Some insurance companies provide significant discounts when automatic fire sprinkler systems are installed. •	Sprinklers keep fires small. In sprinklered residences, 90 percent of fires are contained by the operation of just one sprinkler. Each head is independently activated by the heat of a fire as needed. Only the sprinkler heads in the immediate area of the flames will operate. •	The odds are 1 in 16 million that a sprinkler will accidentally discharge because of a manufacturing defect. One study concluded that improper sprinkler operation is generally less likely and less severe than mishaps involving standard home plumbing systems. Despite the "sight gags" on television sit-coms, burnt toast or cigarette smoke is not enough to trigger sprinkler operation. •	Home fire sprinklers decrease fire damage by as much as two-thirds in residences with fire sprinklers when compared with those without sprinklers. Because the fire sprinkler system reacts so quickly, it can dramatically reduce the heat, flames, and smoke produced in a fire. And, home fire sprinkler systems release only 10 to 26 gallons of water per minute. In a home without sprinklers, a fire department often arrives after the fire has grown to dangerous levels. At that point, a number of hose streams must be applied to the fire at 125 gallons per minute for each hose. The resulting water damage is actually much lower with home fire sprinklers. •	To ensure sprinkler system reliability, be sure to use a qualified contractor who adheres to NFPA codes and standards and local fire safety regulations. •	Publish a newspaper series on how to recognize potential fire hazards in the home and workplace. •	Run a story featuring interviews with local fire officials about how to make homes fire-safe. •	Provide tips on conducting fire drills in the home, mentioning the need for multiple escape routes and a meeting place outside of the home. •	Highlight the importance of home smoke alarms by running monthly "battery-check reminders." •	Avoid smoking in bed, or when drowsy or medicated. Bed linens are highly combustible. It is easier to be burned, and highly likely individuals will suffer severe burns, when fires start in beds. Drowsy or medicated people may forget lit materials, resulting in fire. •	Provide smokers with deep, sturdy ash trays. Douse cigarette and cigar butts with water before disposal. Smoking materials is the leading cause of residential fire deaths in the United States. •	Keep matches and lighters up high, away from children, preferably in a locked cabinet. Children are fascinated by fire and may play with matches and lighters if they are not kept out of reach. •	Make sure your home heating source is clean and in working order. Many home fires are started by poorly maintained furnaces or stoves, cracked or rusted furnace parts, or chimneys with creosote buildup. •	Use portable heaters in well-ventilated rooms only. Keep blankets, clothing, curtains, furniture, and anything that could get hot and catch fire at least three feet away from all heat sources. Plug heaters directly into the wall socket and unplug them when they are not in use. Portable heaters use oxygen and produce potentially toxic gases. It is best to keep them well-ventilated to avoid gas build-up. •	Use kerosene heaters only if permitted by law in your area. Refuel kerosene heaters outdoors only, after they have cooled. Kerosene has a low flash point. If mistakenly dripped on hot surfaces, it can cause fires. •	Have chimneys and wood stoves inspected annually and cleaned if necessary. Chimneys and wood stoves build up creosote, which is the residue left behind by burning wood. Creosote is flammable and needs to be professionally removed periodically. •	Keep the stove area clean and clear of combustibles, such as towels, clothing, curtains, bags, boxes, and other appliances. Combustible materials near stoves may catch fire quickly when your attention is elsewhere. •	Cook with short or restrained sleeves. Loose sleeves can catch fire quickly. •	Conduct a home hazard hunt. Many things around the home can be fire hazards. Taking time to look for and eliminate hazards greatly reduces your risk. •	Check electrical wiring in your home. Fix frayed extension cords, exposed wires, or loose plugs. •	Make sure wiring is not under rugs, over nails, or in high traffic areas. •	Outlets should have cover plates and no exposed wiring. •	Avoid overloading outlets or extension cords. •	Only purchase appliances and electrical devices that bear the label of a testing laboratory such as Underwriter's Laboratories (UL), Factory Mutual (FM), etc. •	Store combustible materials in open areas away from heat sources. •	Place rags used to apply household chemicals in metal containers with tight-fitting lids. •	Buy only testing laboratory-labeled heaters and follow the manufacturer's directions. Heaters that have gone through rigorous testing and are approved for use in the home are less likely to cause fire. •	Get out as quickly and as safely as possible. The less time you are exposed to poisonous gases, the safer you will be. •	If a stove fire starts, slide a lid over the burning pan and turn off the burner. Leave the lid in place until the pan is completely cool. Using a lid to contain and smother the fire is your safest action. Getting the fire extinguisher or baking soda to extinguish the fire delays action. Flour and other cooking products can react explosively to flame and should never be sprinkled over fire. Moving the pan can cause serious injury or spread the fire. Never pour water on grease fires. •	If you are escaping through a closed door, feel the door, cracks, and doorknob with the back of your hand before opening the door. If it is cool and there is no smoke at the bottom or top, open the door slowly. If you see smoke or fire beyond the door, close it and use your second way out. If the door is warm, use your second way out. It is a natural tendency to automatically use the door, but fire may be right outside. Feeling the door will warn you of possible danger. •	If you see smoke or fire in your first escape route, use your second way out. The less time you are exposed to poisonous gases or flames, the safer you will be. •	If you must exit through smoke, crawl low under the smoke to your exit. Fires produce many poisonous gases. Some are heavy and will sink low to the floor; others will rise carrying soot towards the ceiling. Crawling with your head at a level of one to two feet above the ground will temporarily provide the best air. •	Close doors behind you as you escape to delay the spread of the fire. •	If smoke, heat, or flames block your exit routes and you cannot get outside safely, stay in the room with the door closed. Open the window for ventilation, and hang a sheet outside the window so firefighters can find you. Wait by the window for help. The first thing firefighters will do when they arrive at a fire is check for trapped persons. Hanging a sheet out lets them know where to find you. If there is a phone in the room, call the fire department and tell them where you are. •	Once you are out, stay out! Firefighters are trained and equipped to enter burning buildings. If someone is still inside, direct them to that person's probable location. •	Get out first, away from toxic smoke and gases, then call the fire department from a neighbor's home or from an outside phone. If a portable phone is handy during your escape, you may take it with you, but do not waste precious time looking for one. Use your neighbor's phone, a car phone, or nearby pay phone to call for help. •	Give first aid where needed. After calling 9-1-1 or your local emergency number, cool and cover burns, which reduces the chance of further injury or infection. Seriously injured or burned victims should be transported to professional medical help immediately. •	Stay out of fire-damaged homes until local fire authorities say it is safe to re-enter. Fire may have caused damage that could injure you or your family. There may be residual smoke or gases that are unsafe to breathe. •	Look for structural damage. Fire authorities may allow you to re-enter, but may not have completed a thorough inspection. Look for damage that will need repair. •	Check that all wiring and utilities are safe. Fire may cause damage inside walls and to utility lines not normally visible. •	Discard food that has been exposed to heat, smoke, or soot. The high temperatures of fire and its by-products can make food unsafe. •	Contact your insurance agent. Don't discard damaged goods until an inventory has been taken. Save receipts for money spent relating to fire loss. Your insurance agent may provide immediate help with living expenses until you are able to return home, and offer assistance for repairs. 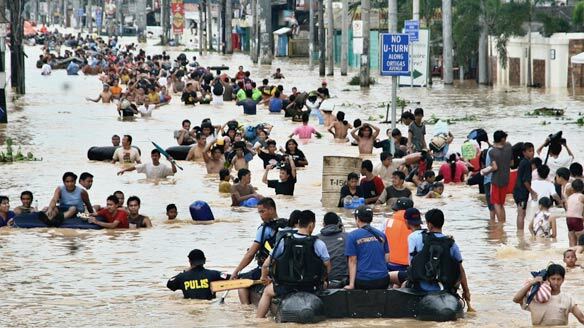 Floods are among the most frequent and costly natural disasters in terms of human hardship and economic loss. As much as 90 percent of the damage related to all natural disasters (excluding droughts) is caused by floods and associated debris flows. Most communities in the United States can experience some kind of flooding. Over the 10-year period from 1988 to 1997, floods cost the Nation, on average, $3.7 billion annually. The long-term (1940 to 1999) annual average of lives lost is 110 per year, mostly as a result of flash floods. Flash floods occur within six hours of a rain event, or after a dam or levee failure, or following a sudden release of water held by an ice or debris jam, and flash floods can catch people unprepared. You will not always have a warning that these deadly, sudden floods are coming. So if you live in areas prone to flash floods, plan now to protect your family and property. As land is converted from fields or woodlands to roads and parking lots, it loses its ability to absorb rainfall. Urbanization increases runoff two to six times over what would occur on natural terrain. During periods of urban flooding, streets can become swift moving rivers, while basements and viaducts can become death traps as they fill with water. Learn about flooding and flash flooding in your area by contacting the local emergency management office, National Weather Service (NWS) office , your American Red Cross chapter, or your planning and zoning department. If you are at risk, take steps to reduce damage and the risk of injury or loss to your family. Know the difference between WATCHES and WARNINGS. •	A National Weather Service (NWS) WATCH is a message indicating that conditions favor the occurrence of a certain type of hazardous weather. For example, a severe thunderstorm watch means that a severe thunderstorm is expected in the next six hours or so within an area approximately 120 to 150 miles wide and 300 to 400 miles long (36,000 to 60,000 square miles). The NWS Storm Prediction Center issues such watches. Local NWS forecast offices issue other watches (flash flood, winter weather, etc.) 12 to 36 hours in advance of a possible hazardous-weather or flooding event. Each local forecast office usually covers a state or a portion of a state. •	An NWS WARNING indicates that a hazardous event is occurring or is imminent in about 30 minutes to an hour. Local NWS forecast offices issue warnings on a county-by-county basis. Many more WATCHES are issued than WARNINGS. A WATCH is the first sign a flood may occur, and when one is issued, you should be aware of potential flood hazards. Be aware of flood hazards. Floods can roll boulders, tear out trees, destroy buildings and bridges, and scour out new channels. Flood waters can reach heights of 10 to 20 feet and often carry a deadly cargo of debris. Flood-producing rains can also trigger catastrophic debris slides. Regardless of how a flood or flash flood occurs, the rule for being safe is simple: head for higher ground and stay away from flood waters. Even a shallow depth of fast-moving flood water produces more force than most people imagine. The most dangerous thing you can do is to try walking, swimming, or driving through flood waters. Two feet of water will carry away most automobiles. •	Develop a Family Disaster Plan. Please see the "Family Disaster Plan" section for general family planning information. Develop flood- specific planning. Learn about your area's flood risk and elevation above flood stage. •	Contact your local Red Cross chapter, emergency management office, local National Weather Service office, or planning and zoning department about your area's flood risk. •	Knowing the elevation of your property in relation to nearby streams and dams will let you know if forecasted flood levels will affect your home. •	Talk to your insurance agent. Homeowners' policies do not cover flooding. Ask about the National Flood Insurance Program (NFIP). •	Use a NOAA Weather Radio with a tone-alert feature, or a portable, battery-powered radio (or television) for updated emergency information. •	Develop an evacuation plan. (See "Evacuation" in the "Family Disaster Plan" section.) Everyone in your family should know where to go if they have to leave. Trying to make plans at the last minute can be upsetting and create confusion. •	Discuss floods with your family. Everyone should know what to do in case all family members are not together. Discussing floods ahead of time helps reduce fear and anxiety and lets everyone know how to respond. •	If you come upon flood waters, stop, turn around, and go another way. Climb to higher ground. If it is moving swiftly, even water six inches deep can knock you off your feet. Many people are swept away wading through flood waters, resulting in injury or death. •	Stay away from flooded areas. Even if it seems safe, flood waters may still be rising. •	Never try to walk, swim, drive, or play in flood water. You may not be able to see on the surface how fast flood water is moving or see holes and submerged debris. •	If you are in a vehicle and become surrounded by water, if you can get out safely, do so immediately and move to higher ground. Vehicles can be swept away in two feet of water. •	Watch out for snakes in areas that were flooded. Flood waters flush snakes from their homes. •	Stay away from creek and stream banks in flooded and recently flooded areas. The soaked banks often become unstable due to heavy rainfall and can suddenly give way, tossing you into rapidly moving water. •	Never play around high water, storm drains, ditches, ravines, or culverts. It is very easy to be swept away by fast moving water. •	Throw away all food that has come into contact with flood waters. Contaminated flood water contains bacteria and germs. Eating foods exposed to flood waters can make you very sick. •	Keep insurance policies, documents, and other valuables in a safe-deposit box. You may need quick, easy access to these documents. Keep them in a safe place less likely to be damaged during a flood. •	Avoid building in a floodplain unless you elevate and reinforce your home. Some communities do not permit building in known floodplains. If there are no restrictions, and you are building in a floodplain, take precautions, making it less likely your home will be damaged during a flood. •	Raise your furnace, water heater, and electric panel to higher floors or the attic if they are in areas of your home that may be flooded. Raising this equipment will prevent damage. An undamaged water heater may be your best source of fresh water after a flood. •	Install check valves in building sewer traps to prevent flood water from backing up into the drains of your home. As a last resort, when floods threaten, use large corks or stoppers to plug showers, tubs, or basins. •	Construct barriers such as levees, berms, and flood walls to stop flood water from entering the building. Permission to construct such barriers may be required by local building codes. Check local building codes and ordinances for safety requirements. •	Seal walls in basements with waterproofing compounds to avoid seepage through cracks. •	Consult with a construction professional for further information if these and other damage reduction measures can be taken. Check local building codes and ordinances for safety requirements. •	Contact your local emergency management office for more information on mitigation options to further reduce potential flood damage. Your local emergency management office may be able to provide additional resources and information on ways to reduce potential damage. •	Disaster Supplies Kit basics. •	If you live in a frequently flooded area, stockpile emergency building materials. These include plywood, plastic sheeting, lumber, nails, hammer and saw, pry bar, sand, shovels, and sandbags. •	Have your community join the National Flood Insurance Program. Any community may join the NFIP. Check with your local emergency management office for more information. •	Publish a special section in your local newspaper with emergency information on floods and flash floods. Localize the information by printing the phone numbers of local emergency services offices, the American Red Cross chapter, and the nearest hospitals. •	Interview local officials about land use management and building codes in floodplains. •	Work with local emergency services and American Red Cross officials to prepare special reports for people with mobility impairments about what to do if an evacuation is ordered. •	Periodically inform your community of local public warning systems. Explain the difference between flood watches and warnings. Let them know where to turn for emergency broadcast information should they hear a warning on their radio or television. •	Assist hospitals and other operations that are critically affected by power failure by arranging for auxiliary power supplies. •	Contact your local National Weather Service office or emergency management agency for information on local flood warning systems. River and rainfall readings are valuable to local emergency management agencies and the NWS in assessing flood conditions and taking appropriate actions. Advanced warning provided by early detection is critical to saving lives. Automatic flood detection systems are available commercially for flood-prone communities. •	Publish emergency evacuation routes for areas prone to flooding. •	If it has been raining hard for several hours, or steadily raining for several days, be alert to the possibility of a flood. Floods happen as the ground becomes saturated. •	Use a NOAA Weather Radio or a portable, battery-powered radio (or television) for updated emergency information. Local stations provide the best advice for your particular situation. •	Listen for distant thunder. In some types of terrain, runoff from a faraway thunderstorm could be headed your way. •	If you are stopping your vehicle, camp or park away from streams and washes, particularly during threatening conditions. Flood waters can rise quickly and carry you or your belongings away. •	When in or along stream channels, be aware of distant events, such as dam breaks or thunderstorms that may cause flash floods in the area. •	Listen continuously to a NOAA Weather Radio, or a portable, battery-powered radio (or television) for updated emergency information. Local stations provide you with the best advice for your particular situation. •	Everyone in a WATCH area should be ready to respond and act quickly. Floods and flash floods can happen quickly and without warning. Be ready to act immediately. •	Be alert to signs of flooding, and if you live in a flood-prone area, be ready to evacuate at a moment's notice. Floods can happen quickly and you may need to leave with little or no notice. •	Follow the instructions and advice of local authorities. Local authorities are the most informed about affected areas. They will best be able to tell you areas to avoid. •	Fill bathtubs, sinks, and plastic bottles with clean water. Water may become contaminated or service may be interrupted. •	Bring outdoor belongings, such as patio furniture, indoors. Unsecured items may be swept away and damaged by flood waters. •	Move your furniture and valuables to higher floors of your home. If flood waters affect your home, higher floors are less likely to receive damage. •	If you are instructed by local authorities, turn off all utilities at the main power switch and close the main gas valve. In some areas, local authorities may advise you to turn off utilities to prevent further damage to homes and the community. •	Get your preassembled disaster supplies ready. You may need to act quickly. Having your supplies ready will save time. •	Fill your car's gas tank, in case an evacuation notice is issued. If electric power is cut off, gas stations may not be able to operate pumps for several days. •	Be prepared to evacuate. Local officials may ask you to leave if they truly feel your home is at risk from flood waters. •	Listen continuously to a NOAA Weather Radio , or a portable, battery-powered radio (or television) for updated emergency information. Local stations provide you with the best advice for your particular situation. •	Be alert to signs of flooding. A WARNING means a flood is imminent or is happening in the area. •	If you live in a flood-prone area or think you are at risk, evacuate immediately. Move quickly to higher ground. Save yourself, not your belongings. The most important thing is your safety. •	If advised to evacuate, do so immediately. Move to a safe area before access is cut off by flood water. Evacuation is much simpler and safer before flood waters become too deep for vehicles to drive through. •	Follow recommended evacuation routes. Shortcuts or alternate, nonrecommended routes may be blocked or damaged by flood waters. •	Leave early enough to avoid being marooned by flooded roads. Delaying too long may allow all escape routes to become blocked. •	Stay out of areas subject to flooding. Dips, low spots, canyons, washes, etc., can become filled with water. •	If outdoors, climb to high ground and stay there. Move away from dangerous flood waters. •	If you come upon a flowing stream where water is above your ankles, stop, turn around, and go another way. Never try to walk, swim, or drive through such swift water. Most flood fatalities are caused by people attempting to drive through water, or people playing in high water. If it is moving swiftly, even water six inches deep can sweep you off your feet. •	Avoid already flooded areas, and areas subject to sudden flooding. Do not attempt to cross flowing streams. Most flood fatalities are caused by people attempting to drive through water, or people playing in high water. The depth of water is not always obvious. The roadbed may be washed out under the water, and you could be stranded or trapped. Rapidly rising water may stall the engine, engulf the vehicle and its occupants, and sweep them away. Look out for flooding at highway dips, bridges, and low areas. Two feet of water will carry away most automobiles. •	If you are driving and come upon rapidly rising waters, turn around and find another route. Move to higher ground away from rivers, streams, creeks, and storm drains. If your route is blocked by flood waters or barricades, find another route. Barricades are put up by local officials to protect people from unsafe roads. Driving around them can be a serious risk. •	If your vehicle becomes surrounded by water or the engine stalls, and if you can safely get out, abandon your vehicle immediately and climb to higher ground. Many deaths have resulted from attempts to move stalled vehicles. When a vehicle stalls in the water, the water's momentum is transferred to the car. The lateral force of a foot of water moving at 10 miles per hour is about 500 pounds on the average automobile. The greatest effect is buoyancy - for every foot that water rises up the side of a car, it displaces 1,500 pounds of the car's weight. So, two feet of water moving at 10 miles per hour will float virtually any car. Many persons have been swept away by flood waters upon leaving their vehicles, which are later found without much damage. Use caution when abandoning your vehicle, and look for an opportunity to move away quickly and safely to higher ground. •	Seek necessary medical care at the nearest hospital or clinic. Contaminated flood waters lead to a greater possibility of infection. Severe injuries will require medical attention. •	Help a neighbor who may require special assistance - infants, elderly people, and people with disabilities. Elderly people and people with disabilities may require additional assistance. People who care for them or who have large families may need additional assistance in emergency situations. •	Avoid disaster areas. Your presence might hamper rescue and other emergency operations, and put you at further risk from the residual effects of floods, such as contaminated waters, crumbled roads, landslides, mudflows, and other hazards. •	Continue to listen to a NOAA Weather Radio or local radio or television stations and return home only when authorities indicate it is safe to do so. Flood dangers do not end when the water begins to recede; there may be flood-related hazards within your community, which you could hear about from local broadcasts. •	Stay out of any building if flood waters remain around the building. Flood waters often undermine foundations, causing sinking, floors can crack or break and buildings can collapse. •	Avoid entering ANY building (home, business, or other) before local officials have said it is safe to do so. Buildings may have hidden damage that makes them unsafe. Gas leaks or electric or waterline damage can create additional problems. •	Report broken utility lines to the appropriate authorities. Reporting potential hazards will get the utilities turned off as quickly as possible, preventing further hazard and injury. Check with your utility company now about where broken lines should be reported. •	Wear sturdy shoes. The most common injury following a disaster is cut feet. •	Use battery-powered lanterns or flashlights when examining buildings. Battery-powered lighting is the safest and easiest, preventing fire hazard for the user, occupants, and building. •	Examine walls, floors, doors, staircases, and windows to make sure that the building is not in danger of collapsing. •	Inspect foundations for cracks or other damage. Cracks and damage to a foundation can render a building uninhabitable. •	Look for fire hazards. There may be broken or leaking gas lines, flooded electrical circuits, or submerged furnaces or electrical appliances. Flammable or explosive materials may travel from upstream. Fire is the most frequent hazard following floods. •	Check for gas leaks. If you smell gas or hear a blowing or hissing noise, open a window and quickly leave the building. Turn off the gas at the outside main valve if you can and call the gas company from a neighbor's home. If you turn off the gas for any reason, it must be turned back on by a professional. •	Look for electrical system damage. If you see sparks or broken or frayed wires, or if you smell burning insulation, turn off the electricity at the main fuse box or circuit breaker. If you have to step in water to get to the fuse box or circuit breaker, call an electrician first for advice. Electrical equipment should be checked and dried before being returned to service. •	Check for sewage and waterline damage. If you suspect sewage lines are damaged, avoid using the toilets and call a plumber. If water pipes are damaged, contact the water company and avoid using water from the tap. You can obtain safe water from undamaged water heaters or by melting ice cubes. •	Watch out for animals, especially poisonous snakes, that may have come into buildings with the flood waters. Use a stick to poke through debris. Flood waters flush snakes and many animals out of their homes. •	Take pictures of the damage, both of the building and its contents, for insurance claims. •	Throw away food that has come in contact with flood waters. Some canned foods may be salvageable. If the cans are dented or damaged, throw them away. Food contaminated by flood waters can cause severe infections. •	If water is of questionable purity, boil or add bleach, and distill drinking water before using. (See information on water treatment under the "Disaster Supplies Kit" section.) Wells inundated by flood waters should be pumped out and the water tested for purity before drinking. If in doubt, call your local public health authority. Ill health effects often occur when people drink water contaminated with bacteria and germs. •	Pump out flooded basements gradually (about one-third of the water per day) to avoid structural damage. If the water is pumped completely in a short period of time, pressure from water- saturated soil on the outside could cause basement walls to collapse. •	Service damaged septic tanks, cesspools, pits, and leaching systems as soon as possible. Damaged sewage systems are health hazards. Tsunamis are most often generated by earthquake-induced movement of the ocean floor. Landslides, volcanic eruptions, and even meteorites can also generate a tsunami. If a major earthquake is felt, a tsunami could reach the beach in a few minutes, even before a warning is issued. Areas at greatest risk are less than 25 feet above sea level and within one mile of the shoreline. Most deaths caused by a tsunami are because of drowning. Associated risks include flooding, water contamination, fires from ruptured tanks or gas lines, and the loss of vital community infrastructure (police, fire, and medical facilities). Learn whether tsunamis have occurred in your area by contacting your local emergency management office, National Weather Service office, or American Red Cross chapter . If you are in a tsunami risk area, learn how to protect yourself, your family, and your property. The West Coast/Alaska Tsunami Warning Center (WC/ATWC) is responsible for tsunami warnings for California, Oregon, Washington, British Columbia, and Alaska. The Pacific Tsunami Warning Center (PTWC) is responsible for providing warnings to international authorities, Hawaii, and U. S. territories within the Pacific basin. The two Tsunami Warning Centers coordinate the information being disseminated. •	WARNING: A tsunami was or may have been generated, which could cause damage; therefore, people in the warned area are strongly advised to evacuate. •	WATCH: A tsunami was or may have been generated, but is at least two hours travel time to the area in watch status. Local officials should prepare for possible evacuation if their area is upgraded to a warning. •	ADVISORY: An earthquake has occurred in the Pacific basin, which might generate a tsunami. WC/ATWC and PTWC will issue hourly bulletins advising of the situation. •	INFORMATION: A message with information about an earthquake that is not expected to generate a tsunami. Usually only one bulletin is issued. •	Learn about tsunami risk in your community. Contact your local emergency management office or American Red Cross chapter. Find out if your home, school, workplace or other frequently visited locations are in tsunami hazard areas. Know the height of your street above sea level and the distance of your street from the coast or other high-risk waters. Evacuation orders may be based on these numbers. •	If you are visiting an area at risk from tsunamis, check with the hotel, motel, or campground operators for tsunami evacuation information and how you would be warned. It is important to know designated escape routes before a warning is issued. •	Plan an evacuation route from your home, school, workplace, or any other place you'll be where tsunamis present a risk. If possible, pick an area 100 feet above sea level or go up to two miles inland, away from the coastline. If you can't get this high or far, go as high as you can. Every foot inland or upwards may make a difference. You should be able to reach your safe location on foot within 15 minutes. After a disaster, roads may become impassable or blocked. Be prepared to evacuate by foot if necessary. Footpaths normally lead uphill and inland, while many roads parallel coastlines. Follow posted tsunami evacuation routes; these will lead to safety. Local emergency management officials can help advise you as to the best route to safety and likely shelter locations. •	Practice your evacuation route. Familiarity may save your life. Be able to follow your escape route at night and during inclement weather. Practicing your plan makes the appropriate response more of a reaction, requiring less thinking during an actual emergency situation. •	Use a NOAA Weather Radio with a tone-alert feature to keep you informed of local watches and warnings. The tone alert feature will warn you of potential danger even if you are not currently listening to local radio or television stations. •	Talk to your insurance agent. Homeowners' policies do not cover flooding from a tsunami. Ask about the National Flood Insurance Program. •	Discuss tsunami with your family. Everyone should know what to do in case all family members are not together. Discussing tsunamis ahead of time will help reduce fear and anxiety, and let everyone know how to respond. Review flood safety and preparedness measures with your family. •	Evacuation Supplies Kit in an easy-to-carry contanier (backpack) near your door. •	Disaster Suplies Kit basics. •	Avoid building or living in buildings within several hundred feet of the coastline. These areas are more likely to experience damage from tsunamis, strong winds, or coastal storms. •	Make a list of items to bring inside in the event of a tsunami. A list will help you remember anything that can be swept away by tsunami waters. •	Elevate coastal homes. Most tsunami waves are less than 10 feet. Elevating your house will help reduce damage to your property from most tsunamis. •	Follow flood preparedness precautions. Tsunamis are large amounts of water that crash onto the coastline, creating floods. •	Have an engineer check your home and advise about ways to make it more resistant to tsunami water. There may be ways to divert waves away from your property. Improperly built walls could make your situation worse. Consult with a professional for advice. •	If your community is at risk, build and publicize locations of tsunami evacuation routes. Post signs directing people to higher ground away from the coast. •	Review land use in tsunami hazard areas so no critical facilities, such as hospitals and police stations; or high occupancy buildings, such as auditoriums or schools; or petroleum-storage tank farms are located where there is a tsunami hazard. Tsunami damage can be minimized through land use planning, preparation, and evacuation. •	Publish a special section in your local newspaper with emergency information on tsunamis. Localize the information by printing the phone numbers of local emergency services offices, the American Red Cross chapter, and hospitals. •	Periodically inform your community of local public warning systems. •	Work with local emergency services and American Red Cross officials to prepare special reports for people with mobility impairments on what to do if an evacuation is ordered, and develop plans to assist them with evacuation if necessary. •	Interview local officials and insurance companies about the proper types of insurance to cover a flood-related loss. Include information on the economic effects of disaster. •	Drop, cover, and hold on. You should first protect yourself from the earthquake. •	When the shaking stops, gather your family members and evacuate quickly. Leave everything else behind. A tsunami may be coming within minutes. Move quickly to higher ground away from the coast. •	Be careful to avoid downed power lines and stay away from buildings and bridges from which heavy objects might fall during an aftershock. •	Listen to a NOAA Weather Radio, Coast Guard emergency frequency station, or other reliable source for updated emergency information. As the energy of a tsunami is transferred through open water, it is not detectable. Seismic action may be the only advance warning before the tsunami approaches the coastline. •	Check your Disaster Supplies Kit. Some supplies may need to be replaced or restocked. •	Locate family members and review evacuation plans. Make sure everyone knows there is a potential threat and the best way to safer ground. •	If you have special evacuation needs (small children, elderly people, or persons with disabilities) consider early evacuation. Evacuation may take longer, allow extra time. •	If time permits, secure unanchored objects around your home or business. Tsunami waves can sweep away loose objects. Securing these items or moving them inside will reduce potential loss or damage. •	Be ready to evacuate. Being prepared will help you to move more quickly if a tsunami warning is issued. •	Listen to a NOAA Weather Radio, Coast Guard emergency frequency station, or other reliable source for updated emergency information. Authorities will issue a warning only if they believe there is a real threat from tsunami. •	Follow instructions issued by local authorities. Recommended evacuation routes may be different from the one you use, or you may be advised to climb higher. •	If you hear an official tsunami warning or detect signs of a tsunami, evacuate at once. A tsunami warning is issued when authorities are certain that a tsunami threat exists, and there may be little time to get out. •	Take your Disaster Supplies Kit. Having supplies will make you more comfortable during the evacuation. •	Get to higher ground as far inland as possible. Officials cannot reliably predict either the height or local effects of tsunamis. Watching a tsunami from the beach or cliffs could put you in grave danger. If you can see the wave, you are too close to escape it. •	Continue listening to a NOAA Weather Radio , Coast Guard emergency frequency station, or other reliable source for emergency information. The tsunami may have damaged roads, bridges, or other places that may be unsafe. •	Help injured or trapped persons. Give first aid where appropriate. Call for help. Do not move seriously injured persons unless they are in immediate danger of further injury. •	Use the telephone only for emergency calls. Telephone lines are frequently overwhelmed in disaster situations. They need to be clear for emergency calls to get through. •	Stay out of the building if waters remain around it. Tsunami waters, like flood waters, can undermine foundations, causing buildings to sink, floors to crack, or walls to collapse. •	When re-entering buildings or homes, use extreme caution. Tsunami-driven flood waters may have damaged buildings where you least expect it. Carefully watch every step you take. •	Look for fire hazards. There may be broken or leaking gas lines, flooded electrical circuits, or submerged furnaces or electrical appliances. Flammable or explosive materials may come from upstream. Fire is the most frequent hazard following floods. •	Check for gas leaks. If you smell gas or hear a blowing or hissing noise, open a window and quickly leave the building. Turn off the gas using the outside main valve if you can, and call the gas company from a neighbor's home. If you turn off the gas for any reason, it must be turned back on by a professional. •	Use tap water if local health officials advise it is safe. •	Watch out for animals, especially poisonous snakes, that may have come into buildings with the water. Use a stick to poke through debris. Tsunami flood waters flush snakes and animals out of their homes. •	Open the windows and doors to help dry the building. •	Shovel mud while it is still moist to give walls and floors an opportunity to dry. •	Check food supplies. Any food that has come in contact with flood waters may be contaminated and should be thrown out.